Remember when I posted about my skincare routine a few months ago featuring the Mint Julep Mask? I've recently updated my routine and wanted to share with you guys my latest discovery - the GlamGlow ThirstyMud line and GlamGlow ThirstyCleanse. These products are amazing and have worked wonders for my skin that's been going through a harsh winter on the east coast in New Jersey. Check out my latest post from Instagram below where I discuss what each product does! 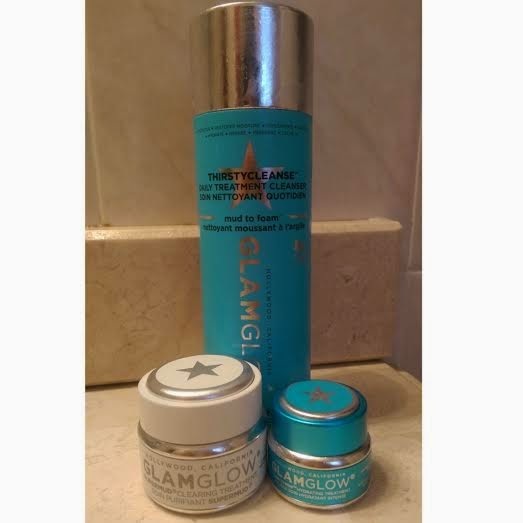 "Finally stepped up my skincare routine with GlamGlow! I'm slightly obsessed with this stuff, I've never seen my skin look so clear and radiant before. I've struggled with acne on and off since I was 13 and never found a product line that's given me results like this. The ThirstyCleanse is a hydrating facial cleanser that removes makeup and impurities. The Super-Mud is a mask that helps clear out blackheads and pimples and reduce the appearance of pores. It can also be used as a spot treatment if you're having a really stubborn breakout. My favorite is the ThirstyMud, a hydrating treatment that you can leave on overnight or mix in with your moisturizer. It has helped my skin so much this winter and prevented it from drying out. This stuff is pricey and I never believed the hype before, but it's one of those things that you have to try for yourself. Loving these products and makeup application has never been easier!" I understand that this product is expensive, but it's worth it. When it comes to skincare, this is the one area of beauty that I recommend splurging on hands down. You may even be able to find the GlamGlow masks at your local Marshall's or TJMaxx, I recently saw them there for around $35 - what a steal!